The Bait Sack is the fastest, easiest, and most secure lure protector on the planet. Just squeeze with one hand to open, drop the lure in, place the line under the line keeper, and clip onto your rod. It's that simple! No more Velcro, tangled lures, or damage to your gear, and no hooks in yourself or your carpet. The Bait Sack is great for all anglers whether on a boat, kayak, float tube or on shore. 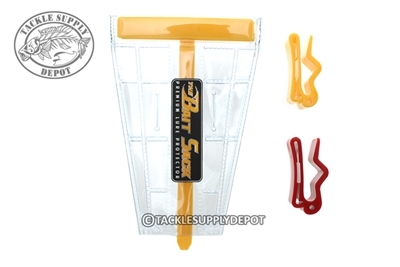 Protect yourself and your gear with The Bait Sack! Offered in multiple sizes to accommodate and array of lures. Small - 3.75" x 5.25" - Perfect for crank baits, topwaters, spoons, jerk baits, and jigs. Medium - 4.5" x 7.5" - Ideal for small/medium umbrella rigs, large crank baits, small/medium swimbaits, large topwaters. Large - 5.25" x 9.5"- The perfect fit for large umbrella rigs, 5-8" swimbaits, XL topwaters, large walking baits, XL crankbaits. Each pack includes one Bait Sack Lure Protector and Two Rod Clips.